The North Mississippi VISTA Project is proud to announce that it is expanding and will be placing its newest AmeriCorps VISTA Member at the Sunflower County Freedom Project. Nestled deep in the Mississippi Delta, Sunflower County has a median family income that is half the national average. Over 40% of students will leave high school without earning a diploma. The Sunflower County Freedom Project was founded to reverse these trends. Over the course of the last 18 years, the project has developed a program filled with intense academic enrichment, mentoring, health education, and educational travel. The goal of the Freedom Project, to empower each child with skills to become a leader, heavily aligns with the North Mississippi VISTA Project’s, to fight poverty through education. 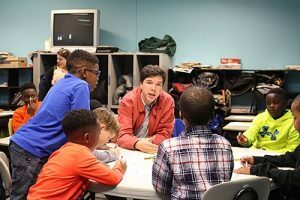 Every year, they place up to 25 full-time volunteers with non-profits around North Mississippi to help organizations build their programs. VISTA Members commit to a year serving communities struggling with poverty, while, at the same time, living at the poverty level themselves. The VISTA serving the Sunflower County Freedom Project will gain professional skills writing grants, creating data systems, developing volunteer opportunities and expanding arts programming. In addition to these professional development opportunities, VISTA members also receive a modest living stipend, health benefits, and non-competitive eligibility for federal jobs. Any person interested in applying to become the VISTA for the Sunflower County Freedom Project can find more information at http://vista.olemiss.edu/apply/ or can email any questions to vista@olemiss.edu.